No matter the reason or the season, your visit to Madison is sure to be memorable. From capitol to campus ... from sparkling lakes to picturesque landscapes ... from a mix of menus to an array of places to stay ... let us be your one-stop-shop for planning a terrific tour experience! Experience the beauty and grandeur of the Wisconsin State Capitol building and grounds, which are open to the public. Walk the University of Wisconsin-Madison campus, which includes scenic Lake Mendota, Observatory Drive, Bascom Hill and the renowned Memorial Union Terrace. Bring home fresh flowers, fruits, vegetables and more from the Dane County Farmers&apos; Market, located on the Capitol Square every Saturday morning, April-November. Get on the lakes by renting a canoe, kayak or sailboat, or by reservation at one of Greater Madison&apos;s many waterfront dining venues. Stroll through Olbrich Botanical Gardens, featuring the tropical Bolz Conservatory and 16 acres of outdoor display gardens, featuring the elaborate Thai Pavilion. If you&apos;re seeking more of a more formal tour, select one of the itinerary ideas below to plan your time in town! Breweries, Wineries & Spirits: Curate a tour that takes advantage of our local craft culture. Dairy Discovery: Discover why Wisconsin is known for dairy as you taste-test your way through town. Discover Mr. Wright: Tour architectural treasures designed by Madison-area native Frank Lloyd Wright. Madison Museums: Don&apos;t miss the museums that dot the stretch between the Capitol Square and State Street. Outdoor Adventure: Discover more than 200 miles of biking and hiking trails, or get out on one of our five local lakes. 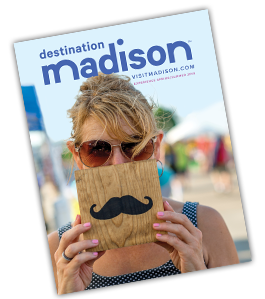 Wisconsin Culinary Experience: Savor our destination via an eclectic array of eateries! To download our group tours resource sheet, click here. To discuss details about our destination or to book your next tour, contact us by e-mail or at 608.255.2537.